At Thiruvallikkeni divyadesam, sashtiapthapoorthi celebrations of Methavimani, Gambhira Vakvarshi, Dr Mandayam Ananthanpillai Venkatakrishnan Swami is being celebrated grandly. The first phase lined up great scholars performing kalakshepams at Nampillai sannathi at Thiruvallikkeni. 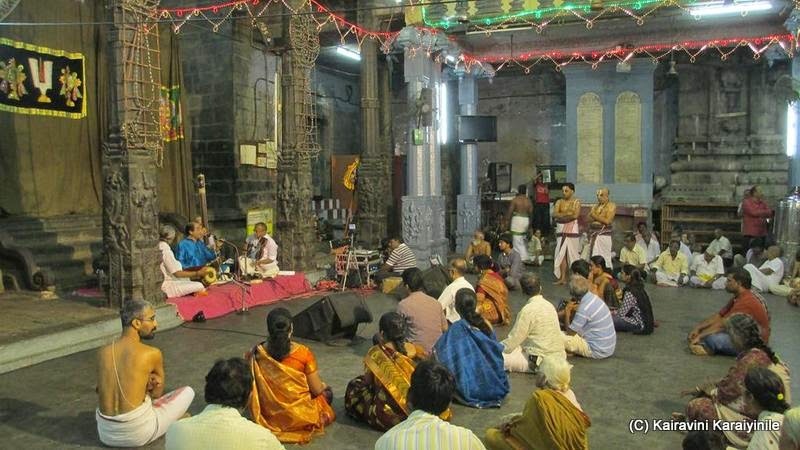 It is reaching a crescendo and on Sri Jayanthi day (16th Sept 2014) – ‘Krishna Ganam’ by Padma Bushan, Sangeetha Kalanidhi, Vainika Gayaka Shiromani, Harikatha Choodamani Madurai TN Seshagopalan was arranged at Sri Parthasarathi Swami Thirukovil. We all know well that ‘Madurai Thirumalai Nambi Seshagopalan’ is a classical vocalist, musician and composer. 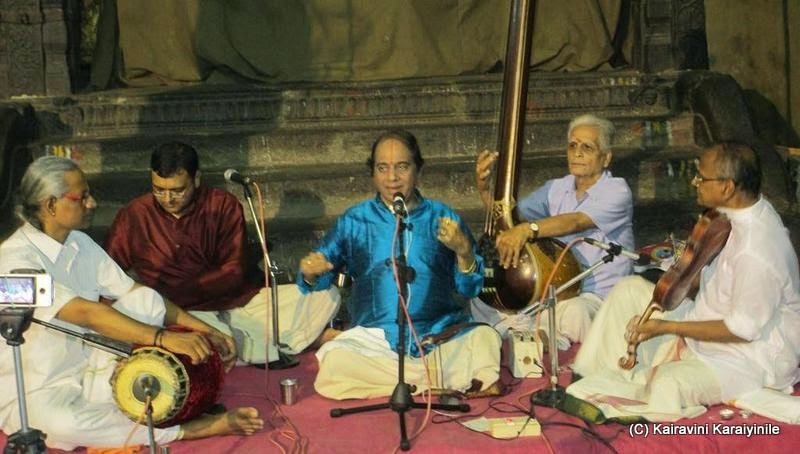 He is a Master of Veena and Harmonium is lesser known and ….. he is an exponent of Harikatha too. Shri TN Seshagopalan was first learnt under his mother, and later under tutelage of Ramanathapuram C. S. Sankarasivan. He holds a degree in science from Madras University and a degree in music fromMadurai Kamaraj University where he later served as professor of music. Harikatha is a form of Hindu religious discourse in the format of storytelling tuned to music and laced with moral values. Harikatha usually deals with the stories from the Indian epics like Ramayana and Mahabharata or the life of saints. It aims to educate the people on the literary and religious values. In some ways in Ramayana age itself, this existed and Naradha muni propagated; the epic Hero Rama’s sons Lava Kusha sang the ithihasam Ramayana as learnt from Sage Valmiki. Harikatha owes its existence to Andhra Pradesh and is still prevalent in most parts as an age-old tradition. Sri Seshagopalan was recently conferred ‘Harikatha Choodamani’ Award by Sri Krishna Gana Sabha. Earlier recipients of this award are Kalyanapuram Aravamudhachariar and Thanjavur Kamala Murthy. 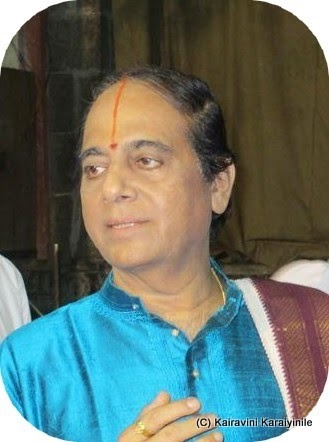 It is stated that Sri Seshagopalan who was awarded Padma Bushan for excellence in vocal classic music in 2004 is capable of rendering any theme in ‘Harikatha form’ – such is his mastery and passion of the multi-dimensional artist playing the veena, harmonium and keyboard at concerts and the flute and sitar for personal pleasure. He has innovated in classical Carnatic music by using the Porta Mento (pitch slider) on the western keyboard to accurately produce 'gamakas' or oscillations of notes. The year was 1991 and the day Makara Sankaranti. During a felicitation for his 87-year-old guru, this vidwan was asked to present a vote of thanks. Impressed by his lines, the guru interrupted to announce, “He is already a popular musician. Watch out! When this boy, my disciple, turns 50, he will earn a name for himself in the art of Harikatha. I may not be alive then, but most of you here will live to see my prediction come true.” The guru was Ramanathapuram C.S. Sankara Sivan and the disciple – Madurai T.N. Seshagopalan. TNS has gone on to collect accolades, awards and titles, including Sangita Kalanidhi. And his guru’s words came true when he recently received the Harikatha Choodamani Award conferred by Sri Krishna Gana Sabha. “My mother was my first guru in Harikatha,” begins TNS, going down memory lane. My headmaster Ganapathia Pillai helped me with songs, composed by him, including the narration for the story titled, ‘Gandhi Mahan Charithram.’” Seshagopalan cites references from their discourses and sings a few lines, showing the kind of impact those stalwarts had on him. TNS has presented Harikathas on various topics such as ‘Tamil Tyagayya’ (on Papanasam Sivan), Ramayanam (Valmiki and Kamban), Krishna Leela Tarangini and Nandanar Charithram. Recently, during the 150 year celebration of Swami Vivekananda, he offered ‘Moola Murthiyum Utsava Murthiyum,’ juxtaposing Ramakrishna Paramahamsa and Swami Vivekananda. His penchant for thematic concerts - on Kamba Ramayanam, Naalayira Divya Prabhandam, Tiruvarutpa, Thayumanavar and Kaviyarasu Kannadasan - has helped him acquire knowledge on various subjects. His experiences with the doyens of Carnatic music and association with his guru have held him in good stead. His expertise in Sanskrit, Tamil and Telugu is evident when he quotes fluently from the works of Tyagaraja, Annamayya, Valmiki, Kamban and so on. In 1983 he played hero in a Tamil movie "Thodi Raagam". Age certainly has not withered his looks or his spirits – the devotees at Sri Parthasarathi Swami Kovil thoroughly enjoyed his mellifluous voice on that day. He was accompanied by his son TN. 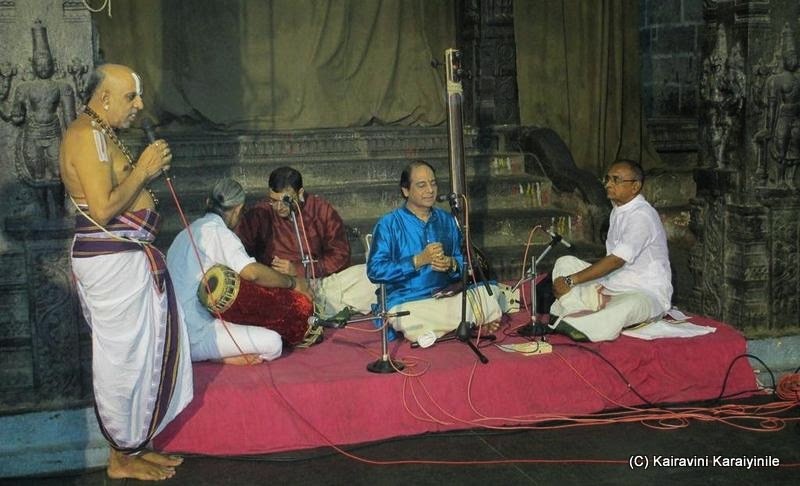 Krishna Seshagopalan and by SD Sridhar on Violin and J Balanji in Mridangam.